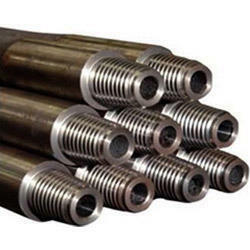 Manufacturer & Supplier of Drill Rods & DTH Drilling Rods. Our product range also comprises of Down The Hole Hammer, DTH Button Bits and Tricone Bits. Special heat treatment of pipe, which gives longer life for the drillrod.The drill pipe material selection and heat treatment process are done with world class technology to meet the toughest requirements of the customers. These technologies bring sup high resistance to corrosion and abrasion of drill rods and increases resistance to wear and tear. We are only the manufacturers of friction welded hardened drill rods. 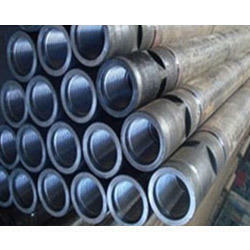 Friction Welded Drill Rods increases the life of the Drill Rods than the normal Drill Rods. Reduce one side rubbing, hole deviation and leakages at joints. No welded layer will be visible and therefore less tolerance in the drill rod guide. Traction Force and Strength will be increased by 40%. Available Sizes :- 3" / 3.5" / 4.5" / 5.5" / 8"
Looking for Drill Rod ?